CF04(CF05) - Special elements - Q-net International Ltd. The Q-net Pro queue management software can be extended with customer feedback features. 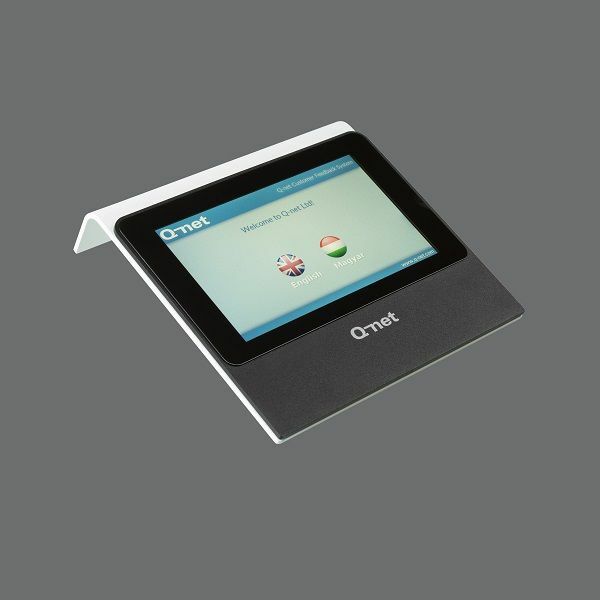 The CF04 is a 7” touch screen device, installed at each serving counter facing the client. At the end of the transaction the device offers the possibility for the served client to give feedback by filling out a questionnaire. The questions and answers are freely configurable, unlimited and will be automatically presented on the language on which the customer’s ticket was issued. The system generated data/result can be seen in the SH41 statistics and monitoring optional software module. Also the appearance (background, colors) can be modified by selecting one of the pre-designed “skins”. The on-stand version of CF04 (CF05) is able to act as a branch customer feedback unit: the customers should stop by at this unit and enter their ticket number first and answer the questions. This is a cheap solution, but not every customer will give his opinion therefore the end user will not receive a full information about the opinions. This entry was posted in Feedbacks, Hardware, Pro, Pro Feedbacks, Queue Management Systems, Solutions. Bookmark the permalink.